Robinson Cano’s home run in the top of the 10th inning gave the American League a 2-1 win. MIAMI — It was getting late Tuesday evening in the American League All-Star clubhouse, and Nelson Cruz was starting to panic. He looked through his pants. Fumbled through his equipment bag. Looked up and down in his locker. His cell phone, the one that snapped the most outrageous picture in All-Star Game history, was missing. 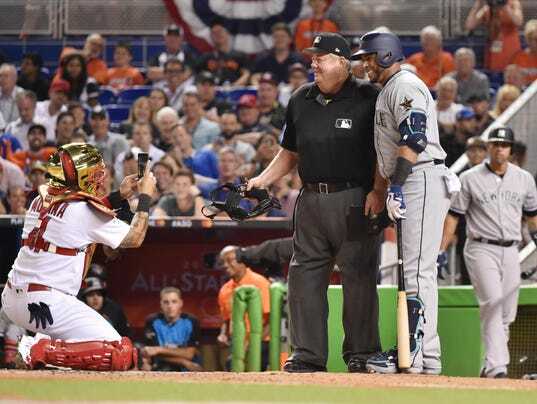 Suddenly, after the American League’s 2-1, 10-inning victory over the National League at Marlins Park, with Robinson Cano, Cruz’s Seattle Mariners’ teammate hitting the game-winner, we had drama. We had our Tom Brady moment. But before Major League Baseball’s security team was summoned, and private investigators called in, Cruz finally located the phone in another bag. Ah, the phone that captured the only moment that had the All-Star Game buzzing, was secure.